Freedom Within - A Christian newsletter ministry from behind prison walls. T IS MY PLEASURE and a great blessing to introduce you to a very dear friend of mine, Justin Martin. 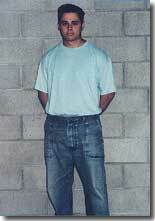 I came into contact with Justin almost two years ago through Prison Fellowship, the prison ministry of Chuck Colson. Since Justin and I began corresponding, we have come to have a great deal of mutual respect for each other. Justin is a wonderful human being and even though he has broken the laws of the land and now finds himself incarcerated, I personally can vouch for his honesty in ownership to whatever wrongs he may have done. It is not my intention to pass judgement on his life, but only to bring you into his world and views from his perspective of looking inside out. I in no way condone any wrong that he may or may not have done, but with a passion and a love for him, commend his endevour to rehabilitate himself and to unselfishly share with others in the hope that they may benefit from his mistakes. I myself have been blessed and helped by Justin. Therefore we are thrilled to bring to you Freedom Within, a newsletter that has been written from a place that most of us will never experience. Let us remember that many of God's elect and those who are the apple of His eye have written many works while in a similar situation. So I pray that you will find a compassion and a love and a great blessing while reading the things that he and others have written. I ask that you will keep Justin and the work he is endevouring to do before the Lord daily in prayer.